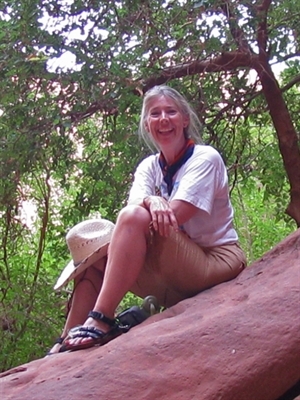 PAGE LAMBERT returns to celebrate her 22nd river-writing journey for women in Utah's beautiful Westwater Canyon on the Colorado River. Joining Page again as her special guest (back by popular demand!) is ROXANNE SWENTZELL, world renowned Santa Clara Pueblo sculptor, author, and co-founder of the Flowering Tree Permaculture Institute. THIS SPECIAL TRIP will explore writing and sculpting as complementary forms of creative expression. Whether journaling or writing professionally, an established artist or just beginning, the natural world unleashes powerful creative energy. During this six day trip, Roxanne will guide us in sculpting, using river clay and materials gathered from the land, Page will guide us in sculpting with words, and the professional SGE women guides will ensure that our journey is safe, delicious, and well-equipped! The women who participate in these trips have diversified backgrounds; some are experienced writers and artists, many are not. Some have rafted before, many have not. But all share the desire for a creative adventure in the wilderness with other women. We've purposely selected this late-summer trip date to synchronize the pace of the creative journey with the river's more relaxed, late season rhythm. This will be the perfect time and place to rediscover the story of your life! PERSONAL JOURNALING AND SCULPTING TIME is woven into the moments between floating down the Colorado River, hiking at your leisure, or relaxing on shore. Although this is not a workshop, creative discussions about sculpting and writing will take place at the river's edge and continue throughout the day, ending with readings under the stars. "Women rediscover a unique part of themselves in the natural world," Page says, “and we inspire each other in uniquely feminine ways." WHY THE RIVER? Women have always gathered at the river. It is where we traditionally have come to greet the sun, to bathe our children and wash our clothes and fill our cooking pots. It is where we cleansed and purified ourselves. It is where we told our stories. The river has always nourished us. ENJOY 6 DAYS/5 NIGHTS ON THE COLORADO RIVER, which flows from the Rocky Mountains in Colorado to its confluence with the Green River in Canyonlands National Park. 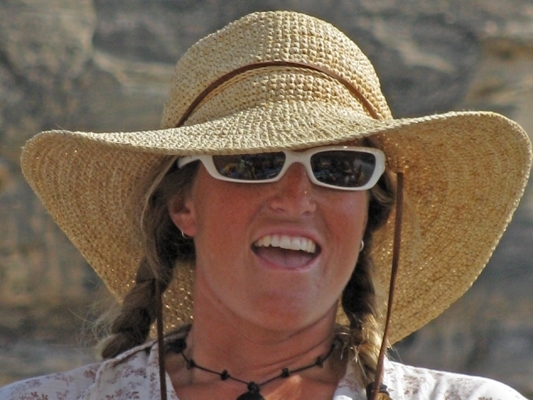 The trip is led by the West’s premier outfitter Sheri Griffith Expeditions out of Moab, Utah. All the comforts are included, and the Sheri Griffith Expeditions women guides are some of the best in the world: fun, talented, professional and inspiring. And they do all the cooking! Roxanne’s sculptures demonstrate an astounding universality, speaking to people of all cultures. Nationally acclaimed and world renowned, her award-winning art is on display and in permanent collections around the world, including the Smithsonian’s National Museum of the American Indian, the White House in Washington, D.C., the Heard Museum in Phoenix, AZ, Cartier in Paris, Santa Fe Convention Center in NM, Museum of Wellington in New Zealand, and the Denver Art Museum in Colorado. Her figures represent a full range of emotions and irrepressible moods, and focus on interpretative female portraits attempting to bring back the balance of power between the male and female inherently recognized in her own Pueblo culture. THE NATURAL WORLD UNLEASES POWERFUL CREATIVE ENERGY. This is not a workshop but it is a great place for journaling and contemplation. Creative discussions take place at the river's edge and continue throughout the day, ending with readings under the stars. “We re-discover unique parts of ourselves in the natural world. We inspire each other in uniquely feminine ways." Previous writing experience is not necessary. Journals will be provided as well as written material for you to take home. 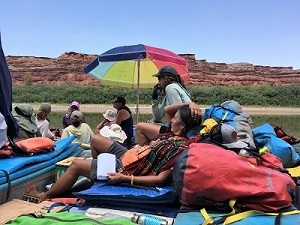 Personal writing time is woven into the moments between floating down the Colorado River, optional hiking, relaxing on shore, and “circling up” with Page and the other river women and guides. View more about Page Lambert's 2019 River Adventure on her website. "This is a fantastic trip! I have experienced this women-only trip twice now and it is terrific. The Sheri Griffith company is excellent, the guides were super and both times the trip brought together amazing women. 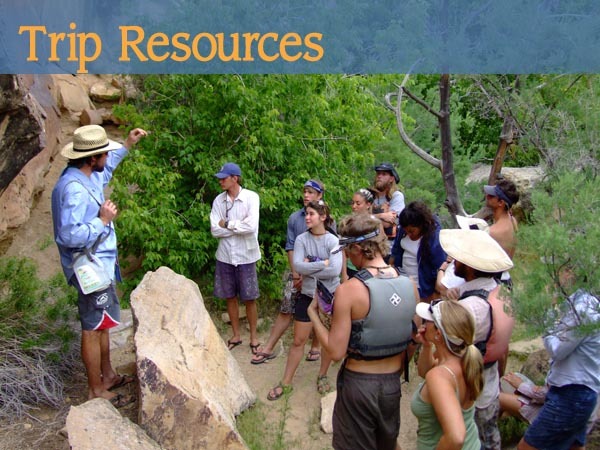 Rafting, hiking, camping, great food... a fabulous trip start to finish!" Writing time, personal time, group facilitation, and fun! Arrival Day: River orientation is held at 5:00 PM the evening before departure, Sunday, August 26, 2018, at the SGE office. The creative adventure begins with a “no-host” dinner with Page and Roxanne following orientation. 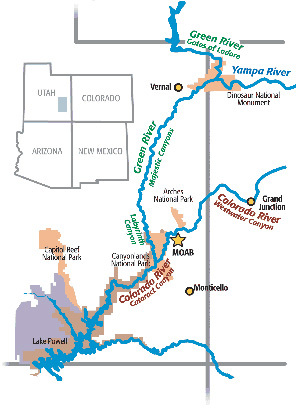 Day One: We will drive to the Loma Boat Ramp, near Loma, Colorado, where we will put-in for this river journey. We'll stop for a hike and for an introduction to clay-work. Day Two: Today we will enter Westwater Canyon. We'll stop for a hike and have some time for writing and clay-work. Day Three: Today we will traverse the rapids of Westwater Canyon. From fun and splashy to exciting, the rapids of Westwater Canyon will never disappoint. Days Four and Five: Today we will cross under what is left of the Dewey Bridge, which burned down in 2008. We will continue on to a beautiful camp near the Fisher Towers. We will layover at this camp for two nights. Day Six: Our last morning will be a leasurly day with a later departure. We will arrive at the take-out at around 4 pm, arriving back at the SGRE office by 5pm. *Note: This is an example itinerary and may change due to weather, water levels, camp availability etc. First to run Gates of Lodore: John Wesley Powell in 1869. 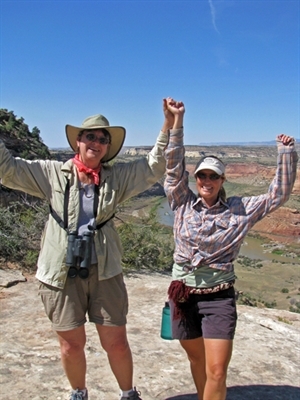 The strong and friendly women guides lead this westwater canyon trip.